I am finally back on my feet today and it feels so good I do not even mind the rain. 'Cause the rain wrote it on my windowpane. That and there is Chopin's "Raindrop" Prelude, played exquisitely by Leonard Pennario. 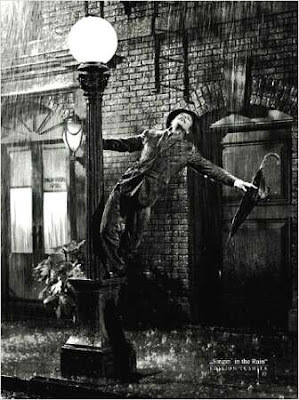 It is called the "Raindrop" because of the soft repeated notes in the left hand, like the beating of drops of rain. There is also Johannes Brahms' "Regenlied," meaning "Rain Song." The sound in this recording is not great but the visuals are. 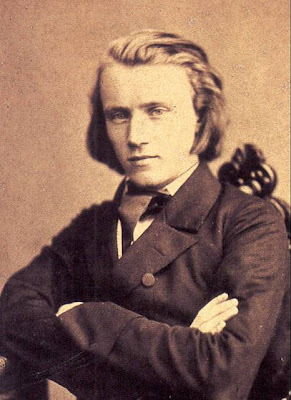 Here is a picture of Brahms. I figured it would grab everyone's attention! Just the way I am counting on Pennario's face to sell my book. I am looking to the future now that I am back on my feet. We have Easter coming up. My whole family is in denial because no one wants to step up to the plate and play host to the fearsome festivities. But I have volunteered. I know, I am crazy. Remember Thanksgiving? But now it is spring and I am over my flu and the chives are coming up in the garden and the rains are soaking the earth and guess what? I am ready to do it all over again. Shall it be ham, or leg of lamb? That is a dilemma because my mother loves lamb but my brother George does not like to eat lamb because lambs are cute and he feels sorry for them. But we all like pigs too and feel sorry for them so if we have ham it is not good to think about that too closely either. There is only one way to solve that dilemma. We must have both! It is so great to be feeling better. VERY glad to hear that you are feeling better Mary!!! !